Why is this girl's hair standing on end? It is this way because of static electricity. Everything is made up of millions of tiny particles, called atoms. Inside atoms are protons and electrons, which have positive and negative electric charges. When you rub two things together, some of the negative charges, or electrons, move from one surface to the other. The object that loses electrons becomes positively charged, and the one that gains electrons becomes negatively charged. Opposites (positive and negative) attract, so the objects pull together. This is static electricity. Experiments like these are best attempted in a museum. 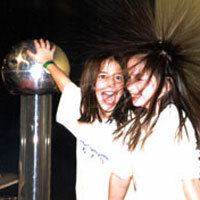 The girls in the photograph are visiting the Liberty Science Center in New Jersey. Several times a year, the center holds a "Camp-In," where groups of kids have fun with the science exhibits until late at night, and then they sleep over in the museum.